0 Comments Published by Cedric Benetti on Friday, September 19, 2008 at 9/19/2008 02:18:00 PM. 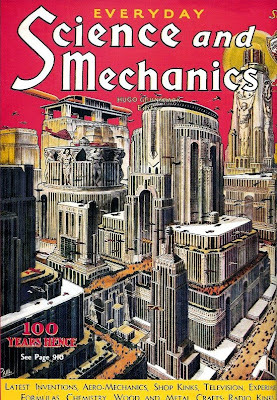 A more or less art deco-ish New York, inspired by Fritz Lang's masterpiece "Metropolis". 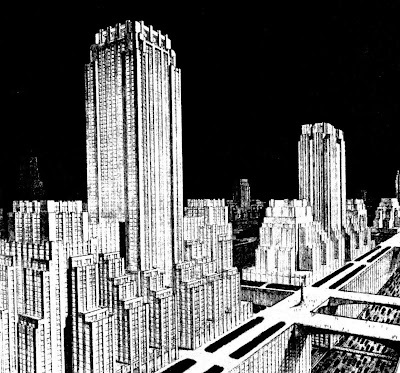 Note the presence of the now tiny Empire State Building. 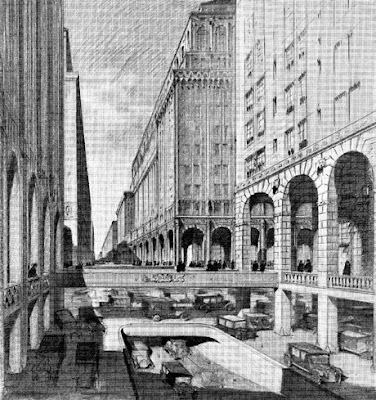 Let's get back on this image in 24 years maybe... Interestingly enough, the large multi-level sidewalks are inspired by the conceptualized New York of the Future of Harvey Corbett, who envisioned elevated and arcaded walkways connected by footbridges in 1923, and thus leaving the entire ground plane of the city to car traffic and bad smells. New York as a Venice of modern ages.